Two very different styles of dance but with one element in common: the Oriental Dance. 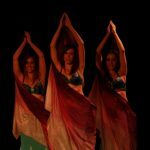 The Oriental Dance is a dance that combines traditional elements from the Middle East along with others from North Africa. It is characterized by its smooth and fluid movements, dissociating and coordinating at the same time the different parts of the body. The Tribal Fusion style is defined by picking up movements and symbols from multiple disciplines and passing them through their sieve to make them their own. It merges West and East. It appropriates music of all kinds and from all over the world and goes through aesthetics and environments very diverse exotic, mystical, contemporary, urban… It is one of the most creative and flexible dances of these moments. Company: Raks Samadhi (Spain – Madrid). Performances: Oct.1, 2017 at 9:00 pm. Duration: 35′ / All Audiences.